Oil magnate, Tonye Dele-Cole, is poised to fly the flag of the All Progressives Congress (APC) in the Rivers State governorship election next year, following the adoption of his candidacy by stakeholders at their apex leadership caucus meeting in Lagos on Thursday. Observers had expected the ticket to be a straight fight between the Director-General of the Nigerian Maritime Administration and Safety Agency (NIMASA), Dr.Dakuku Peterside and Senator Magnus Abe. That, however, was not to be as the Lagos meeting, presided over by Transportation Minister Rotimi Amaechi, who doubles as APC leader in Rivers State, gave Cole the nod. Other party leaders at the Lagos meeting included oil magnate, Chief Dumo Lulu-Briggs; the Director-General of the Nigerian Maritime Administration and Safety Agency (NIMASA), Dr. Dakuku Peterside; a member of the Board of Trustees (BoT) of the party, Chief Sam Jaja and Senator Andrew Uchendu (Rivers East). Informed sources said that Amaechi wanted a ‘neutral’ candidate that would be largely acceptable to the mainstream APC in the state as well as the Abe faction of the party. Amaechi has been pushing for a candidate from the riverine part of the state to take over from the incumbent governor, Nyesom Wike. The riverine area has not produced governor since 1999. Cole, an architect and Chief Executive of Sahara Energy, is a son of Dr. Partick Dele Cole, a former managing director of Daily Times and a former ambassador of Nigeria to Brazil. He is from Abonnema-Kalabari, headquarters of Akuku-Toru (rivernine) Local Government Area. He attended the Lagos meeting along with Peterside who was the party’s candidate in the 2015 election. The NIMASA boss welcomed Cole’s endorsement yesterday as did Abe, who was not at the meeting. But Abe said he was not aware that Cole was an APC member. Peterside, in his response, said: “Our leader, Rt. Hon. Amaechi,” whose leadership they all subscribed to, made a decision on who members of the party in Rivers State should back for the office of governor of Rivers State in 2019, with the lot falling on his friend and brother in Christ (Cole). I made a commitment to the group earlier to stand by whatever decision the leader makes in the overall interest of the party and Rivers State. I reiterated my position yesterday (on Thursday) in the leadership meeting. I thus stand by the decision on Tonye Cole. “We have toiled from 2013 to date (a period of five years) and have made sacrifices and lost lives in the course of enthroning the kind of government we want in Rivers State; a government that will guarantee peace, unity and prosperity. In the course of the struggle, we bonded as one indivisible family under God. “The decision by the leader has been met with mixed reactions, which is expected. My appeal is that we allow the greater interest of APC and Rivers State to prevail. “To those who believe in the vision I shared in the past five years, the leadership I gave at various times and the path of loyalty to the cause I have chosen over time, I urge you all to stand by the Leader, the party and the ordinary people of Rivers State in support of Tonye Cole. Peterside also prayed for unity among the members of APC and victory in the 2019 elections. He added: “I have said it on several occasions that anyone who is interested in serving Rivers people should come forward and offer themselves and make their plans known. 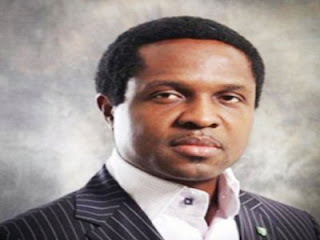 “If a Tonye Cole has been so endorsed, it is a very welcome development. He should come forward and offer himself and make himself known to Rivers people. “I, Senator Magnus Ngei Abe, have said I am going to vie for the governorship ticket of our party, the APC, and I want to repeat that I will vie for the governorship ticket of APC. “Every other Rivers son or daughter who believes that he or she has the capacity and the experience to offer the needed services that our state needs at this time is welcome.